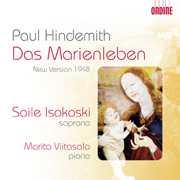 Soile Isokoski’s recording of Paul Hindemith’s Das Marienleben (New Version 1948) is garnering outstanding reviews and accolades throughout the international press (ODE 1148-2). The recording features the Finnish star soprano with her longtime piano duo partner Marita Viitasalo. Together, they perform the revised 1948 version of Hindemith’s 1923 cycle on fifteen poems by Rainer Maria Rilke. The work remains a highlight in the German composer’s output, and Glenn Gould once called it "the greatest song cycle ever written." The Washington Post has listed the CD at the top of its selection of best classical music recordings in 2009. Classical music critic Anne Midgette wrote, "Hindemith’s cycle on Rilke poems, a highlight of his career, may never have sounded better." David Hurwitz from ClassicsToday.com presented the recording as Disc of the Month in February 2010 and gave it a 10/10 accolade for both artistic and sound quality. He wrote, "Isokoski captures every nuance of the text while at the same time retaining that special, slightly understated intimacy of expression that both the poetry and the music demand. Pianist Marita Viitasalo is very much an equal partner in the proceedings, projecting Hindemith's often bare and potentially clunky writing (...) with unflagging elegance and limpid tone." Reviews in Germany have been equally enthusiastic: Reinhard Brembeck of Süddeutsche Zeitung calls this recording "a true miracle" (7 October 2009), while Ekkehard Pluta of Klassik Heute writes that Soile Isokoski managed "to square the circle: even the complicated sounds simple and the music progresses organically" (9 October 2009). Giselher Schubert of Fono Forum calls this "the definite rendition of a truly major work, which could wait for its time." Miquel Cabruj of Klassik.com praises this work’s "reference recording" which he calls "absolutely essential." In Belgium, this CD was given the Prix Caecilia 2009 by the association of professional music critics (Union de la Presse Musicale Belge). Upon the awards ceremony held on March 8, 2010 at the Théâtre Royal de La Monnaie in Brussels, Soile Isokoski said, "I'm very pleased that this prestigious award is bestowed on an intimate Lied cycle such as Das Marienleben, and I wish that this will help to spread further the love for Paul Hindemith's wonderful music." Lyric soprano Soile Isokoski is hailed as one of the finest singers in the world ("Isokoski's lyric soprano is like liquid gold." - David L. Kirk, Fanfare Magazine, March/April 2009). Her CDs for Ondine have been praised as top-choice recordings and garnered the highest distinctions at the BBC Music Magazine Awards, Gramophone Awards and MIDEM Classical Awards.